The Newest Rant: (Not A) Film Friday: So Much for "The Interview"
So, "The Interview", you may have heard about it. A comedy movie featuring Seth Rogen and James Franco, they play the head of (and producer for) a tabloid-styled news program. They learn the leader of North Korea--Kim Jong-un--is actually a fan of the show, and get invited to interview him. This leads to the CIA asking them to assassinate Kim, at which point I imagine various shenanigans and acts of mischief occur. I may never actually know, as Sony has basically given in to the demands of self-declared terrorists hackers and announced that "The Interview" will not be coming out on Christmas day, or possibly at all. That's right, there isn't even a plan to delay the movie or make it go straight to video-on-demand. It's just cancelled. Wow. How did we get here? Another thing you may have heard about was that just recently Sony was hacked (yes, again, but this time it was even worse than in 2011). It now has been confirmed that North Korea-located hackers were behind it, and all sorts of things were leaked. Nothing illegal has come out about Sony, but private details and correspondence now is being gleefully reported by various media outlets. Putting aside the ethical question of if we really need to know about what was in the leaks (if Sony wasn't doing anything illegal do we have the right to pry into the privacy of employees who sent messages about actors they disliked or such? I mean, this isn't at all like with the NSA leak...) it has caused a headache for Sony. In addition, further threats that theaters showing "The Interview" could face attacks were made, and within this week "The Interview" has gone from being an upcoming Christmas release to basically dead in the water. This cancellation of "The Interview" has upset basically everyone. In the delightful paradox of how we always want to see things we can't people now are saying that they had minimal interest in "The Interview" but now they have to see it. Mitt Romney said Sony should offer it for free online as a big middle-finger to North Korea,and Obama said Sony made a mistake choosing to not release it. That's right, Democrats and Republicans agree Sony should release the flick--and the rarity of politicians from both side of the aisle agreeing is equivalent to your odds of seeing a White Rhino. We are basically now at the point where is Sony doesn't release "The Interview" they look like terrorist-capitulation-types who hate America, and if they do release it basically everyone is going to go see it, whether it is good or bad. This actually has had some folk mulling over if we are playing into a secret plan of Sony. I mean, Sony getting hacked clearly wasn't a trick, but seeing all the heat "The Interview" is causing and threats it is getting might have had some crafty Sony executives think, "Hey, this movie is getting so much press, what if say we aren't going to let folk see it?" and of course people will go ballastic because we as a society are more prone to the Streisand-effect than one could believe. I'm not sure how likely this conspiracy-theory is. I would totally believe it that Sony freaked out when threats were made that theaters could be attacked and due to their own choice or because the film industry was nervous at the idea of people avoiding cinemas on Christmas, any immediate release of "The Interview" was canned. The exact reason behind why Sony chose not to release "The Interview" may be unclear, but now everybody wants to see it for reasons that range from having just been interested in the movie and its actors (as I had been), to feeling it is now a political act. I myself just really enjoy movies with Seth Rogen and James Franco, finding almost anything they team-up in to be good--except maybe "This is the End" which I found extremely underwhelming--so I was excited to see "The Interview" and now am sad that I may not be able to. We will probably see in the upcoming days something definitive occurring. 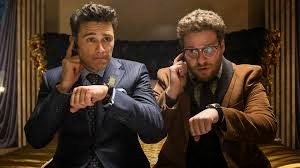 Namely, Sony gives a new release date, puts "The Interview" online, or something of that sort. I would be a bit surprised if they really do just scrap it and try to have us all forget it existed. We will see. In the meantime I can always re-watch "Pineapple Express" to get some laughs. It took until Tuesday, but it seems Sony is going to allow theaters to show "The Interview" and offer it as a video-on-demand for those who feel unease about going to see it. Now the question becomes what theaters will be willing to show it (some independent ones have already said they will) and if all of this hullabaloo over the movie will end up helping it, hurting it, or having little effect on the total profit.